I think we all feel like the world is moving so fast these days and that if you blink you’ll miss something! But on the up side, it makes for an exciting time in the area of assistive technology and communication aids. We, Regional Communication Services, are constantly keeping up with the latest gadgets and upgrades, so that we can provide best practice to the people with complex communication needs that we support, and to other speech pathologists and professionals in our regions – and of course our Communication Coordinator Networks! Karyn showing us some the new and exciting assistive technologies available from Zyteq. Speech pathologists from the Regional Communication Services run a number of these networks across Victoria to provide training and consultation to adult day services. This helps the day service nurture a ‘culture of communication’ within their service, where all staff are equipped with specialised skills to support people with complex communication needs. 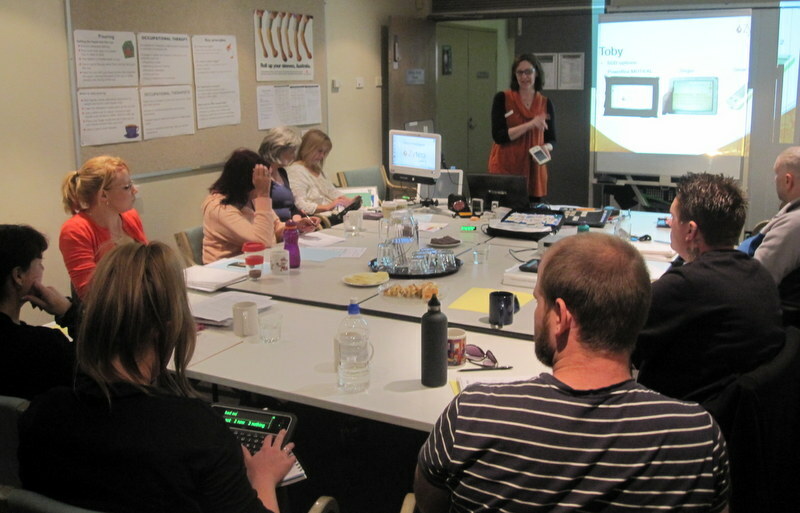 We provide regular training to these networks on a wide variety of interesting topics, and recently the North West Metro Communication Coordinator Network were lucky enough to have Karyn Muscat come out from Zyteq to show us the latest in their assistive technologies! It was such a great day and went all too fast. Everyone agreed that the absolute highlight of the day was the eye-gaze technology! Karyn introduced us to the Tellus 4 Intelligaze, which is a speech generating device that you can access through eye-gaze control. We’d all heard about eye-gaze technology before, but few of us had actually had the chance to see it up close and personal. Karyn gave us all a chance to test out the eye-gaze calibration methods. We started with some experimental and errorless play activities to get comfortable with the technology and how it actually works. We were instantly hooked and it was so exciting to see how far this technology has come! It was fantastic to get the opportunity to test out some of the latest in assistive technologies. We all came away inspired, and with lots of great ideas about how we can best use these emerging technologies to open up new worlds for the people we support. But watch this space, because there’s always more exciting assistive technologies coming! If you’d like more information about Zyteq and their latest assistive technologies just head to http://www.zyteq.com.au/. If you’d like more information about Communication Coordinator Networks within your region contact your local Regional Communication Service. This entry was posted in Uncategorized on March 31, 2014 by crcscope. Thousands of people with intellectual disabilities live in group homes in Victoria. Many of these people have communication difficulties of various sorts. This can make it difficult to live a full and valued life. Communication is essential to many activities both within the home (e.g. choosing what to eat; resolving conflict; asking for help) and beyond (e.g. developing and maintaining friendships; participation in education, employment and leisure). For many group home residents, participation in these activities relies on access to appropriate augmentative communication systems, and to trained staff who can support their use. Good Things is a new training video which has been developed to show how communication can contribute to quality of life in group homes. Good Things demonstrates how communication skills such as active listening, visual symbols and Key Word Signing are used in real-life situations in a group home in Melbourne. It demonstrates how a culture of respect and autonomy can develop when staff understand how to listen to clients and support their expressive communication methods. After months of work from many project partners, the Inner South Communication Service is excited to announce that Good Things will be ready for release in March 2014. The video will be available free of charge through the Internet, and we would like to see it as widely used as possible. Keep watching this blog for a link to the video! Good things was funded by the Department of Human Services. Captions for the hearing impaired were funded by Bayside Council. For further information, please contact the Inner South Regional Communication Service at [email protected]. This entry was posted in Uncategorized on March 13, 2014 by crcscope.